Chris Mapane. Book Comedian Chris Mapane. Chris Mapane , is one of the most energetic comedians on stage. Chris Mapane's energy is contagious and invigorating. 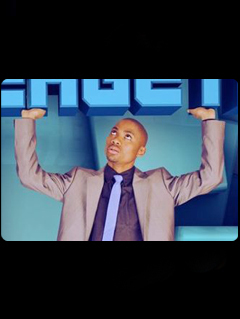 Chris Mapane started doing stand-up comedy as a one man show at the University of the Witwatersrand and at the tender age of 25, Chris Mapane has done it all; from being a headliner to One Man Shows, sharing stage with comedians like David Kau, Barry Hilton and John Vlismas. Chris Mapane was the chairperson of the Poetic Therapy Deja-Vu and Chris Mapane is a founder of Deja-Vu School of Arts. Chris Mapane performed at the Wits hee hee hee comedy festival, Tshwane comedy festival and UP yours comedy festival. Chris Mapane blessed a number of club venues around Johannesburg, Pretoria, Polokwane and Witbank with his comedy and shared stage with other comedians from Nubreed Comedy, Nomad Comedy, Whacked and Parker Leisure. Chris Mapane is the MC for all Blackwhole entertainment gigs. Chris Mapane believes that people complain because they don't see sense. There is sense in almost everything that takes place. So come be part of friends who will be joining Chris Mapane at his One Man Comedy Show, where he will be showing you and your partner, sense in the government behavior and no sense in your behavior. You and your partner will have fun with us, make you feel at home and want to come back for the next show.